On Thursday we are going to concentrate on our Mother's Day project so I needed to finish up the Me Books today. I had two things left to do today. The second to last page is another measuring page. When the children come to school in September we measure them, weigh them, and draw a handprint and footprint. Then in May we do the same thing again and create another page so the children, and mom and dad, can see how much they have grown. I also finished up the "I can write my name page." On this page I have three separate name writing "samples." First the children stamp their name. Later I provide the dots for a trace effect, and finally I let them write their name by themselves. Amazingly I was able to decipher everyone's name. They have come such a long way! The last page of the book is a collection of photographs which we have taken throughout the year. We keep a photo album that parents can look at during the year. At the end I take all the photos out and divide them between the children and put them in a page in their book. This is one of the favorite pages for the children. I added the cover and the books were good to go. The children were so excited to be able to take them home to show mom and dad. What a great memory for both the parents and the children!! As a Mom I LOVE getting these type of things. My daughter got a similar book from her preschool last year and she looks at it all the time!! 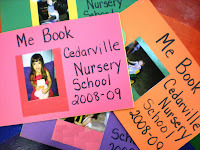 I am a Cedarville mom and love love love this book! A keeper! Trish, you are the best!